We rescued Java from a private owner in 2004. 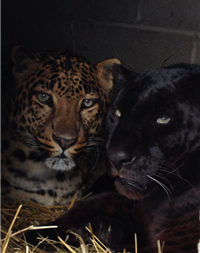 Unlike some privately owned cats, Java was well-taken care of by an owner who educated himself on the care of exotic cats. Due to personal reasons, the owner decided to find a new home for Java. A 20+ year commitment turned out to be too much, even for the most loving owners. It took awhile for Java to get used to his new home and caretakers, but with some time and lots of love, he has adapted quite nicely. He loves his spacious enclosure with its high platforms and catwalks, and most times you’ll find him snoozing way up high. One of his favorite games is playing with his Kong. He will flop onto his back so that he can bite and kick it around. He’ll even play tug-of-war with it. When Java is excited about something, especially his dinner, he’ll make a meowing sound similar to a kitten. 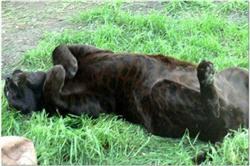 Java is a melanistic (black) leopard, often mistakenly referred to as a black panther. He’s actually dark brown with the same pattern of black spots as any other leopard. 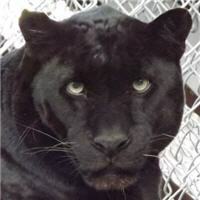 Black panther simply means a large, black cat and most commonly refers to black leopards and black jaguars. 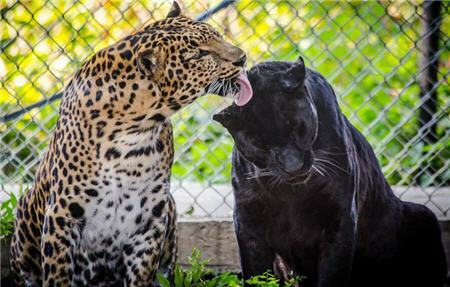 They are not a separate species of leopards.